Should Art Be a Priority for Your Middle Schooler? Yes! Let’s face it. Art is one of those subjects that most people consider nonessential. After all, there is only so much time in the school day and only so much money for curriculum. On top of that, art can be extremely difficult to teach if you don’t have any artistic ability. In addition, not all children are artistically inclined. Why should we force them to take art if they’re not interested? That’s why many parents push art to the back burner and sometimes exclude it altogether. Far from being a nonessential, art addresses and educates the whole person: emotions, intellect, and understanding. Thus, for a middle school child, art should be considered a priority. God is the ultimate artist, and He has created a beautiful universe. When a child paints God’s creation, she learns to appreciate the Creator. Aesthetics— the love of beauty—is a reflection of the image of God in us. Studying and participating in art cultivates that love and the joy that springs from it. Art also provides a means of self-expression. Children can’t always find the right words to express who they are and what they are feeling. By including art and drawing in your homeschool curriculum, you are giving your child a tool by which she can communicate her feelings, even when words are lacking. Drawing is also a great tool for helping a child focus. In my workshop Guiding the Creative Child, I tell parents not to be too hard on their children if they doodle during class time. For many people, doodling actually improves focus. As a doodler myself, I can testify that drawing keeps my mind from wandering when I am in a meeting or listening to a lecture. Finally, art, even if it’s nothing more than coloring, can help a child relax. Even something as simple as coloring a picture relieves stress. I discovered this many years ago when I was going through a rough spot as a pastor. As my wife and I were shopping in a craft store, I found a poster coloring kit. During those difficult days, I spent a lot of time coloring that poster. It didn’t solve my problems, but it did help me cope. Art also develops a person’s intellect. For example, a course in drawing helps students develop observational skills. When I teach art, the first exercise I give my students is what is called blind contour drawing. I place a simple household object, like a coffee mug, in the center of the table and have them position their paper off to one side. Then I tell them to draw the mug without ever looking at their paper. To accomplish this, they must observe the object closely. With time and practice, their eyes and hands learn to work together. 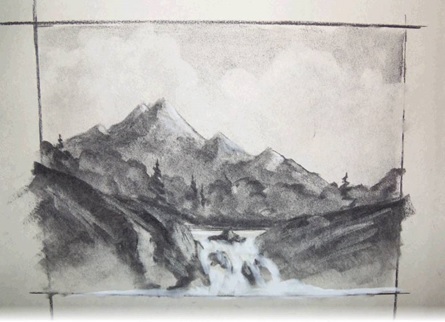 The more a person draws and paints, the sharper their observational skills become. Learning to draw also enhances problem-solving abilities. To draw something as simple as a country road with houses and electrical poles receding into the distance involves learning how to work with concepts such as perspective and foreshortening. Even challenges as simple as trying to draw or paint a water droplet force the artist to think through and analyze how the water impacts the light as it passes through the droplet. Every time a student is challenged to draw or paint something, he must solve problems related to all seven elements of art: line, space, form, texture, space, value, and color. When we consider the more traditional disciplines such as philosophy (world-view), history, and even mathematics, we find art there as well. For example, art is a window into both philosophy and culture. Recently, I studied the intricate art of the Shipibo people of Peru and discovered that the designs and patterns were a direct reflection of their religious beliefs. Similarly, the colorful patterns woven into the cloths made by the Quechua people of South America reveal the village or region from which the artisan came. In his groundbreaking video series How Shall We Then Live? the late Francis Schaeffer demonstrated repeatedly how an artist’s worldview is reflected in his art. Art can also illumine history. Picasso’s huge black and white mural Guernica was painted in response to the Nazi’s bombing of the village of the same name. Even if you don’t like Picasso’s style, it is difficult to look at that painting without feeling a sense of the terror that the villagers experienced as Hitler’s planes deva- stated their town. Recently at a homeschool convention, a man stopped by the See the Light booth and commented that art and mathematics were related. Not being particularly strong in math, I’d never made that connection. But the more I thought about it, the more I realized he was correct. From the complex, precision, geometric patterns of Celtic, Byzantine, and Islamic art to the science of color mixing, even mathematics has its place in art. Art is not simply a play time or a break from the “real” subjects. It can become a hub that enhances children’s development—spiritually, emotionally, and intellectually. When you plan your middle school child’s curriculum this year, be sure to include art.